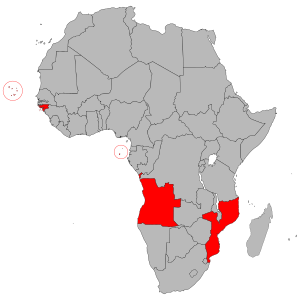 The Portuguese-speaking African countries (Portuguese: Países Africanos de Língua Oficial Portuguesa; PALOP), also known as Lusophone Africa, consist of six African countries in which the Portuguese language is an official language: Angola, Cape Verde, Guinea-Bissau, Mozambique, São Tomé and Príncipe and, since 2011, Equatorial Guinea. The six countries are former colonies of the Portuguese Empire. From 1778 until independence, Equatorial Guinea was also a colony of the Spanish Empire. In 1992, the five Lusophone African countries formed an interstate organisation called PALOP, a colloquial acronym that translates to African Countries of Portuguese Official Language (Portuguese: Países Africanos de Língua Oficial Portuguesa). The PALOP countries have signed official agreements with Portugal, the European Union and the United Nations, and they work together to promote the development of culture and education and the preservation of the Portuguese language. Together with Portugal and Brazil in 1996, the Portuguese-speaking African countries established the Community of Portuguese Language Countries (Portuguese: Comunidade dos Países de Língua Portuguesa, abbreviated to CPLP), which East Timor later joined in 2002 and Equatorial Guinea in 2014. Equatorial Guinea adopted Portuguese as its third official language in October 2011. Originally a Portuguese colony before it was claimed by Spain in 1778, Equatorial Guinea has adopted Portuguese as the country's third official language in order to be allowed into the CPLP despite its limited historical and cultural commonalities with the other countries. Equatorial Guinea was traditionally not considered part of the PALOP and it was not a founding member of FORPALOP in June 2014, the recently created institution that includes the PALOP, a forum for political-diplomatic cooperation to deepen historical friendship ties and solidarity between these African states. It should however be noted that Portuguese is sparsely used throughout the country. It was admitted into the CPLP in 2014 and, subsequently, it became FORPALOP's sixth member. These five African countries are former colonies of the Portuguese Empire, which collapsed shortly after the Carnation Revolution military coup of 1974 in Lisbon. The strains of the Portuguese Colonial War overextended and weakened the Portuguese dictatorship and precipitated the overthrow of António de Oliveira Salazar's regime. Younger military officers, who were disillusioned by a war that was far-off and taxing, began to side with the pro-independence resistance against Portugal and eventually led to the military coup d'état on April 25, 1974. The long-lasting rule of the Portuguese colonial empire had varying effects on the African states even after they gained independence in the 1970s. The legacy of Portuguese empire-building pervades the postcolonial discourse that attempts to explain the development of the modern nation-state in Lusophone Africa and shed light on its failures. Members of the Community of Portuguese Language Countries (CPLP). ^ a b "PALOP". Eurostat. Archived from the original on 2013-10-15. Retrieved 25 September 2012. ^ a b "PALOP and Timor Leste: cooperation with Lusophone countries". European External Action Service. Retrieved 25 September 2012. ^ "Projecto Apoio ao Desenvolvimento do Sistema Judiciário PIR PALOP". Retrieved 25 September 2012. ^ ""Speech of the Ambassador Dulce Maria Pereira, executive secretary to the Community of Portuguese-Speaking Countries to the General Assembly of the United Nations concerning HIV/AIDS"". United Nations. 25 June 2001. Retrieved 25 September 2012. ^ "Roundup: Portuguese-Speaking African Countries embrace new era". English People Daily. ^ "Equatorial Guinea Adds Portuguese as the Country's Third Official Language". PR Newswire. 14 October 2011. Retrieved 12 January 2016. ^ "Obiang convierte al portugués en tercer idioma oficial para entrar en la Comunidad lusófona de Naciones" (in Spanish). Europa Press. 15 July 2007. ^ "Noticias online em tempo real". Jornal Digital. 2014-12-01. Retrieved 2016-12-22. ^ a b Chabal, Patrick, et al. 2002. A History of Postcolonial Lusophone Africa. Indiana University Press, chps. 1,2,3.